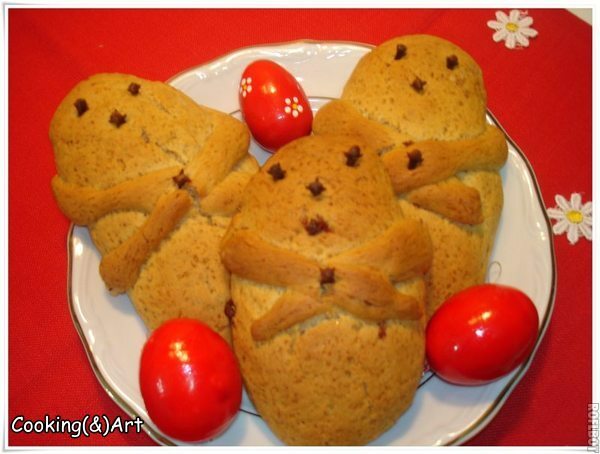 One common tradition throughout Greece for the Saturday of Lazarus is the baking of Lazarakia. Lazarakia is a spice bread used to remember the miracle of Jesus raising Lazarus from the dead. It has many sweet spices in it and is Lenten, meaning it has no dairy or eggs in it. Lazarakia comes in the shape of a man (which is supposed to be Lazarus). There is a mouth and cloves for eyes. Unlike Tsoureki, Lazarakia is not brushed with egg or butter to give it a gloss finish (to not break the fast). "If you don't make a Lazaro, you won't have your full of bread" (“Λάζαρο δεν πλάσεις, ψωμί δεν θα χορτάσεις”), is a saying among some Greeks. Lazarakia should look like the Lazarus in the icon of his resurrection, bound like a dead man with a shroud. On the island of Kos girls who are engaged make a Lazaro the size of a small child, filled with countless goodies and embroidered almost like the coils of the wedding, to send to the groom. The "Lazaroudia" in many households are filled with ground walnuts, almonds, figs, raisins, honey, extra spices and children eat it hot. For receipes to make Lazarakia, see here, here, here and here. For video instruction, see here.